beginning with the use and study of animals by humans, and leading to regular social interactions. Today this is manifested in the adoption of animals (alloparenting) and the care provided to them in the course of that relationship. The roots of this relationship may be found in the development of three often recognized traits of humans: making and using tools, symbolic behavior (including language, adornment, and rituals), and domestication of other species. Shipman views the animal connection as a fourth trait, tying the other three together and having an immense effect on human evolution, genetics, and behavior (2010: 522). Homo erectus shown with tools. Though tool use has been documented in other nonhuman mammals, the manufacture and use of tools by humans is an extremely complex behavior. Modern chimpanzees are often recognized for their tool usage, but this usage varies whereas humans consistently use tools. Early humans used tools to process carcasses, and we have evidence of this from the marks left on the bones after contact with implements. Stone tools gave humans an advantage: they no longer needed to compete with other scavengers; they could hunt game on their own and/or drive off those scavengers if needed. The increased meat in the human diet meant that humans occupied a predatory niche, and as such necessarily needed to disperse so that their localities could support their needs. While Shipman makes clear that the fossil record supports that expansion of geographic range about 2 mya, the more interesting point, in my opinion, is that in seeking out live game, humans needed to learn about their prey, which opened the door for a more meaningful relationship with animals. Ritual, art, ochre, and personal adornment are used to transmit information about such concepts as beliefs, group membership, or style, leaving physical manifestations visible in the archaeological record. Nothing interpreted as art, ritual, the use of ochre, or personal adornment has been reported in nonhuman mammals in the wild (521). As more sophisticated stone tools were developed, humans could pursue larger game. But this might often require collaboration, which encouraged language. Perhaps the strongest example of this is prehistoric art which depicts animals extensively, revealing morphology, coloring, behaviors, and sexual dimorphism (Shipman 2010: 524). It creates a record to be shared with others. Domestication required humans to select for desirable behavioral traits and control the reproductive and genetic output over generations. They lived in close proximity to the animals, historically even bringing them into the home. Indeed, the physical closeness of humans to animals has allowed some infectious diseases to enter the human population from animal hosts, e.g., measles (dogs), mumps (poultry), tuberculosis (cattle), and the common cold (horses) (529). However, the benefits have outweighed the costs when it comes to keeping animals near: animals are much more than a food source. The Goyet dog is at least 17,000 years older than the next oldest domesticate (also a dog) … animals were domesticated first because their treatment was an extension of tool making (Shipman 2010: 524). Animals were domesticated as living tools! They expanded the reach of humans and made other resources more accessible. Animals could provide labor, milk, wool, and opportunities for the production of tools and clothing. And domestication was hedged on an understanding of biology, ecology, physiology, temperament and intelligence. While much has been made recently of the monkey who appears to have adopted a cat, such cross-species alloparenting is rare. Humans are the exception. 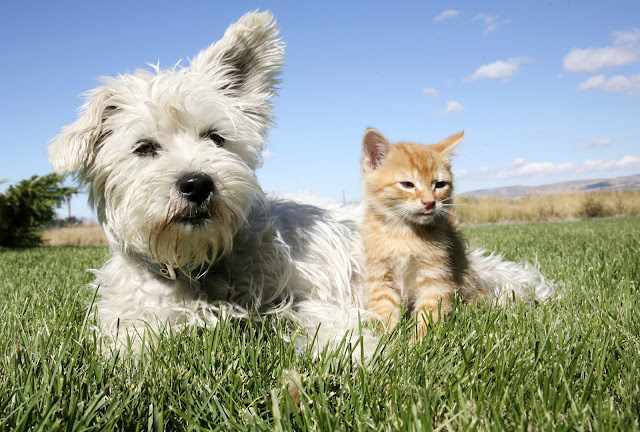 We routinely take in animals integrate them into our families, creating a beneficial relationship. Our connection to Fido may be deeply rooted in our evolutionary history. Ed. Note: The National Evolutionary Synthesis Center (NESCent) is offering two travel awards to attend ScienceOnline to bloggers interested in evolution, so I figured I would throw my hat into the ring with this post. Wish me luck! Good luck with the meeting scholarship! Additionally, and I was told this by an archaeology grad student in my department--cheetahs were one of the first cats used as a sort of "living tool" because of its speed. I'm going to be thinking about this all day now. Hey SMB, glad it got the wheels turning—it's a really interesting idea. It certainly makes a lot of sense when you think about it, and is a rather logical progression. I admit I looked at our dog a bit differently today. I really hope no one reads the post and thinks of hierarchies though! The article itself is really worth the read, so if you have some time, check it out.